Thanks to Flickr CreativeCommons for the photos! This is for me, personally, my original running route. Back in about 1975 I started running (after a couple of fizzled attempts, previously) exactly this route. 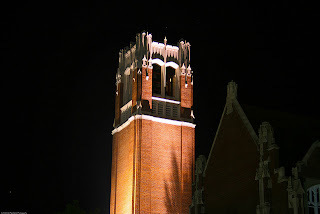 Back then, I lived in the "student ghetto" neighborhood, just north of the University of Florida (UF) campus. 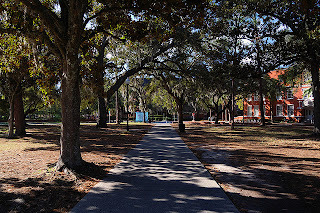 For me, the most scenic place to head was through the campus to lake Alice, a nature preserve that had long provided me a quiet haven among my many youthful storms, so I ran this route hundreds of times. This route also takes you on a tour of the UF campus, the navel of the Gator Nation, with its lush tropical vegetation and brick buildings. 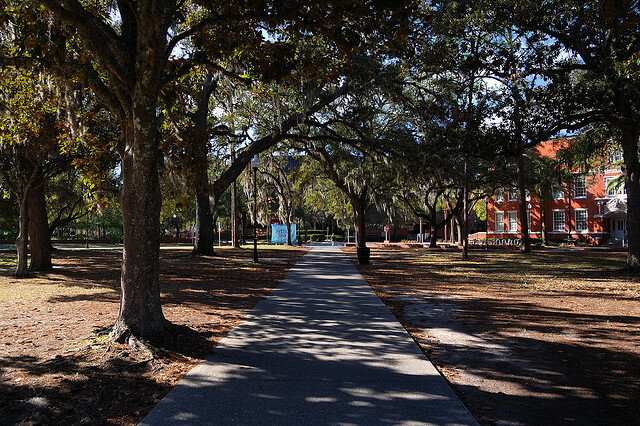 Enter the campus into the park-like spot with the "Universtiy of Florida" gate. Follow the sidewalk that heads diagonally into the campus for about 50 meters, until the red-brick Bryan Hall comes up on your right. Turn right to run westwards right behind the building, towards Matherly Hall straight ahead. 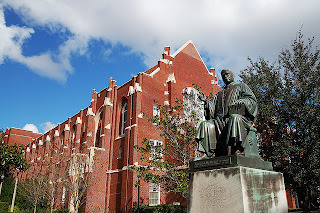 Just before you reach Matherly Hall, turn left and then right to run along Matherly's south side, still heading west. This is the College of Business Administration complex. 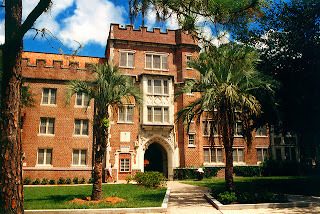 You will then run between Anderson Hall and the old Smathers Library until you run straight into the newer Library West. 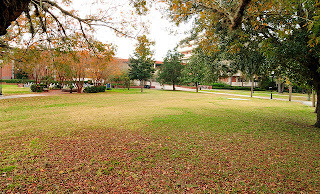 Turn left to run into UF's cultural heart, the Plaza of the Americas, where students relax between classes, reading, playing frisbee, while others hand out political pamphlets or club information. I spent many a time manning the tables for various political- and ecological groups here in the 1970s, like the Environmental Action Group. Head diagonally across the plaza towards its southwest corner, where you hit Newell Drive. 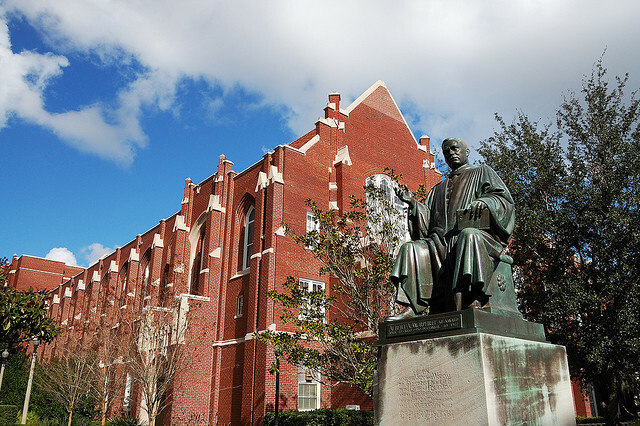 Head south on Newell for one block, passing the gothic auditorium and Century Tower, a campus landmark, on the left. Just after the tower, turn right to run between the two buildings across the street, heading west again. The building of the left is the Computer Sciences Building. When you pass the building, turn left to run into the big open lawn (the "Green Banana") sloping downhill to the southwest. You are now running towards the Reitz Student Union complex. Run past the union buildings on your left, then turn left to run by the main car entrance for the union hotel. Now turn right to run into the little woods, the Reitz Ravine to run along the path with the wooden railing. This is just one of the many sink-holes found on campus, some filled with water, some, like this, just a hole in the ground. It was formed when the limestone rock beneath was hollowed-out by water and collapsed. You'll come out of the ravine at Museum Road and Lemerand Drive. Cross Lemerand to run westwards along Museum Road. On your right you'll see the Graham dormitory sinkhole, then you'll run uphill for a bit, passing Hume dormitory on the left side. 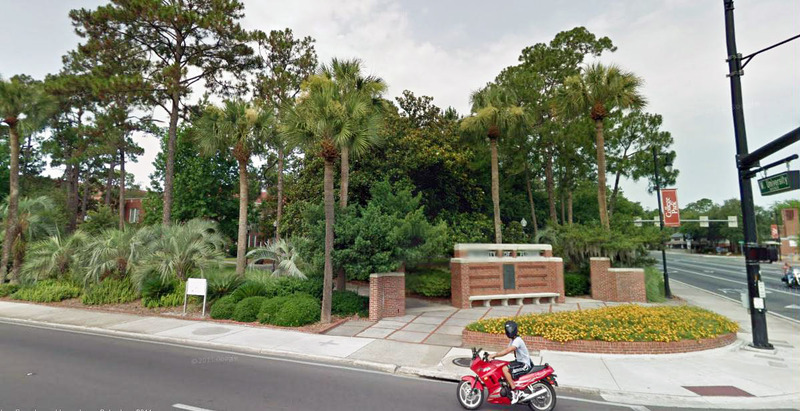 Soon, you'll see a few fraternity houses curving up along the right side. That's Fraternity Row, home to many, but not all the fraternity houses. We're now getting to the best part of the run, the Lake Alice area. The whole side along the left is now a nature preserve. You'll see a little dirt parking lot on the left, where you can take a little side-trip out on the Lake Alice boardwalk. I actually helped build the original boardwalk (I don't know if it's been replaced since then). 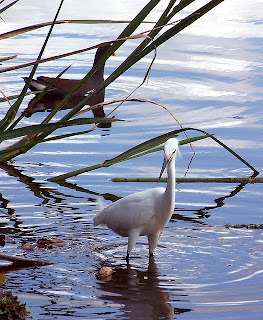 If I may say so, it's really worth the extra few-minute detour to run to the end of the boardwalk to view the waterbirds and jungle. The lake is full of alligators, turtles and other life. After the boardwalk, turn left to continue running westwards along Museum Road. It will curve to the left along the lakeside. 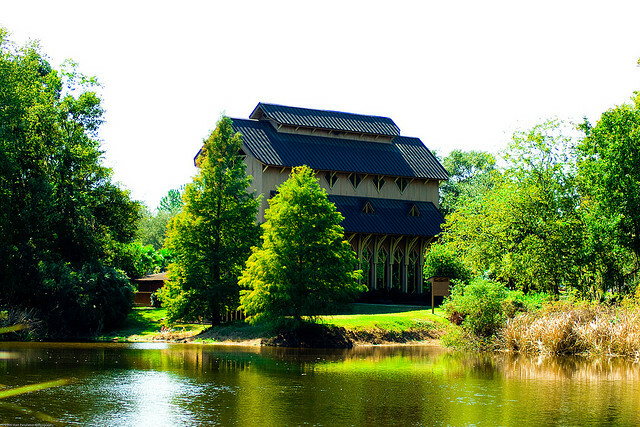 Towards the end of the lake, you'll see the Baughman Meditation Center, looking like a chapel on the lakeside. After the chapel, turn left to continue running along the south side of the lake. There is a big complex of university agricultural buildings to the right. You'll see a path to view the lakeside from the south, so take that to get one last view of the lake. 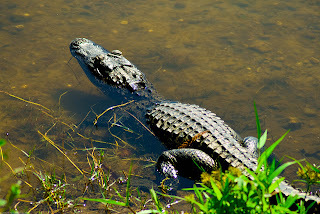 This was always one of the best spots to view alligators. So now, we'll turn around and head back. But to keep it interesting, we'll change the route a bit on the way back. When you again reach Fraternity Row, turn left and run northwards, uphill as the street curves to the right past all the fraternity houses. When the road has curved towards the east, you will see UF's impressive sports complex coming up on the left: baseball, basketball, football, tennis, the running track. It's amazing to see what kind of money has poured into the sports program in the last decades. It's always fun to join the other runners on the track for a couple of quarter-mile laps, if you feel like it. extended, the School of Journalism had its classrooms under the bleachers, where I tried to learn how to write. Stadium Road will turn to the left, becoming Buckman Drive, and heading north. Pass Leigh Hall on the right, and you'll see Buckman Hall and Sledd Hall dormitories on the left, some of the oldest buildings on campus. Right after Leigh Hall, turn right to run straight into the Plaza of the Americas again. 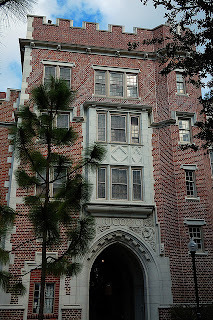 Turn diagonally to your left to follow the same way out as we first entered the campus.